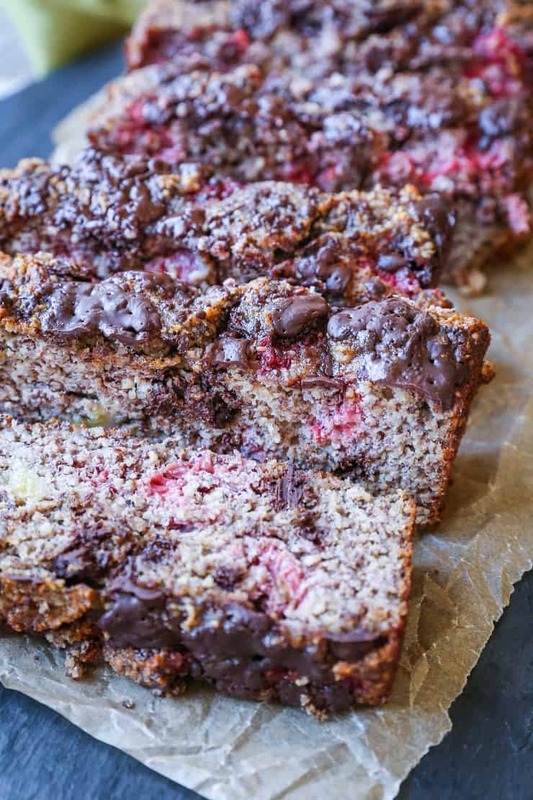 Moist, delicious grain-free paleo raspberry chocolate chunk banana bread made with almond flour. 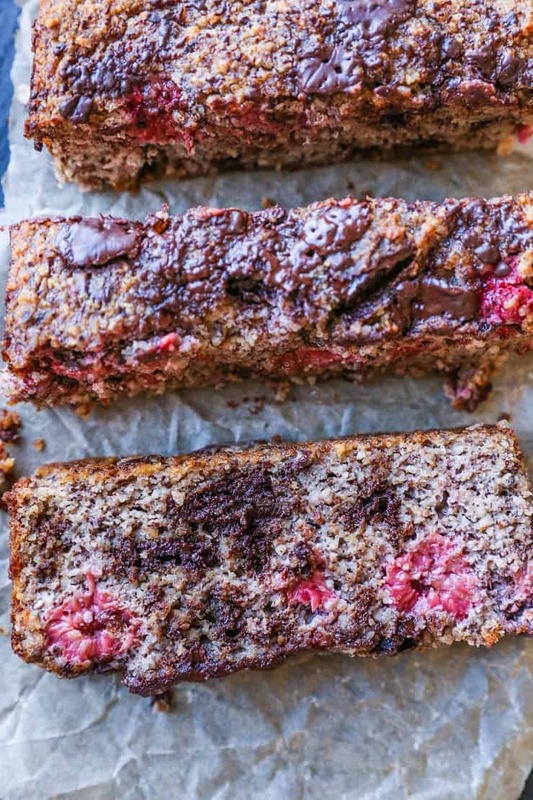 This super flavorful take on classic banana bread is refined sugar-free, gluten-free, and dairy-free. I’m sure you all are out playing, but I thought I’d pop in to say HEY and also give you a little gift (slash project if you’re looking for one). THISLOAF! So, hey! I have another moist loaf for you. 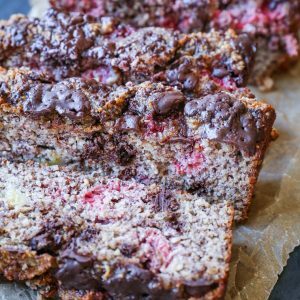 As if banana bread wasn’t delicious enough already, here we are adding tangy raspberries and sweet, sultry dark chocolate to the mix. If you love classic banana bread but sometimes crave a little something different, well, here’s your something different! It’s kinda like the Andy Warhol of banana breads if I may be so bold as to make that comparison. As usual, we prepare the banana bread batter using a blender (you can always use a mixing bowl if that’s your preference or if you don’t own a blender). After the base batter is prepared, we simply fold in the fresh raspberries and chocolate chunks. Transfer the batter to a standard 9” x 5” loaf pan, then bake it in the oven! The result is a heavenly tangy, chocolatey, cinnamony sweet moist loaf of WOWZAHS. It’s one of those loaves you’ll just have to taste to fully grasp the magnanimity. 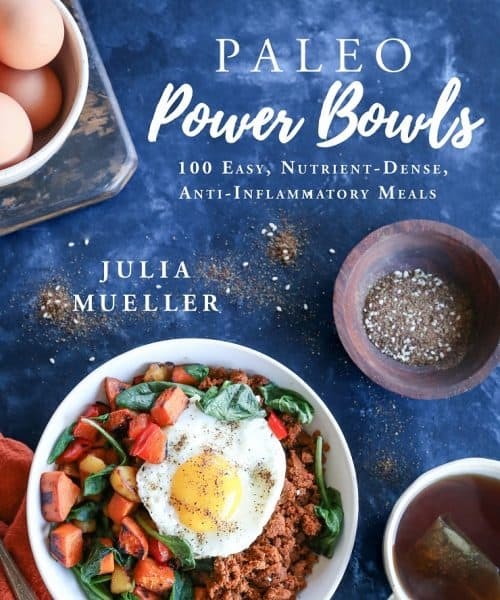 You do as I do and use a paleo chocolate bar for the chocolate chunk portion of this recipe, or use any dark chocolate bar (or chocolate chips) you’d like. 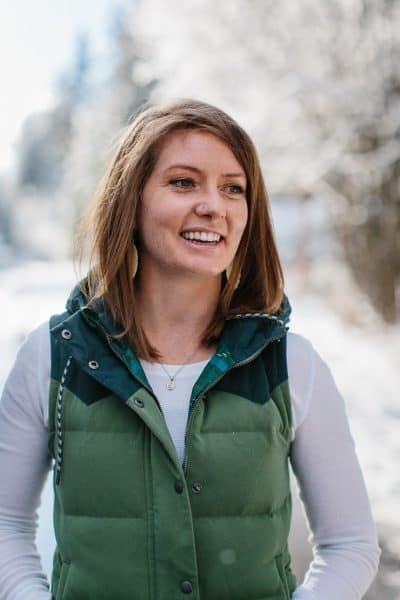 My favorite paleo-friendly chocolate bars are Eating Evolved Signature Dark Chocolate (<- not sponsored, just love), which are dairy-free and sweetened with coconut sugar. Their Almond Sea Salt is also to die for, just FYI if you’re in the market for paleo chocolate bars. Can you even fathom it? Because I love all of my flavors to work in sync, I love heating up a thick slice of this bread with a pat of grass-fed butter (or ghee) for that added creamy/salty essence to balance the sweet. If you’re intolerant to nuts, rather than using almond flour for this banana bread, you can use coconut flour. The recipe will be entirely different since coconut flour absorbs more liquid than almond flour, so use my recipe for Coconut Flour Banana Bread as the base, but follow all the same steps as this recipe. You can also substitute arrowroot flour for the tapioca flour. I store leftovers of all of my breads in the freezer – I cut the remainder of the loaf into slices, wrap it in plastic wrap and then put it in a sealable bag to ensure it doesn’t get freezer burn. Whenever I have a hankering, I simply snag a slice from the freezer and either heat it in the oven or if I’m too impatient, I’ll nuke it in the microwave (I know, I know, free radicals). I believe that’s all you need to know about this fun fest! I hope you love it as much as I do! Preheat the oven to 350 degrees F and line a 9" x 5" loaf pan with parchment paper. 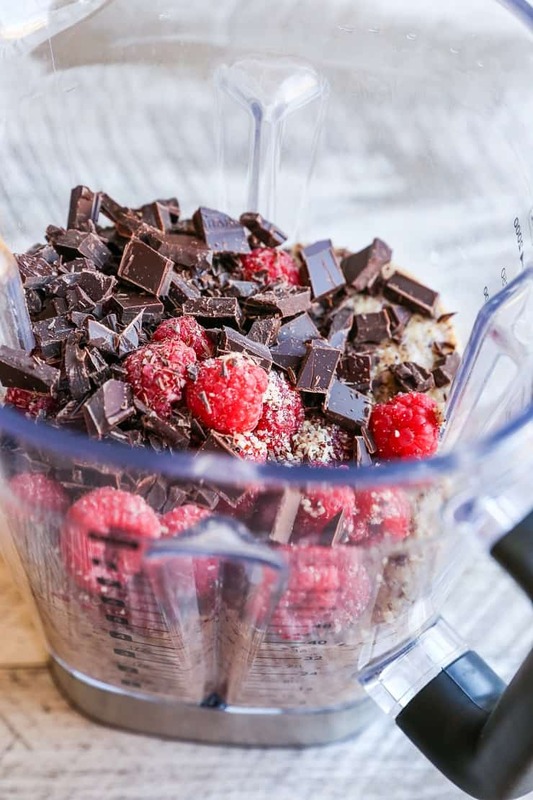 Add all ingredients except raspberries and dark chocolate chunks to a blender and blend until smooth. Carefully fold in the raspberries and dark chocolate chunks using a rubber spatula. Transfer the batter to the prepared loaf pan and bake on the center rack of the preheated oven 40 to 50 minutes, or until sides appear golden-brown and load feels firm when poked in the center. Turn off the oven and allow loaf to sit another 8 minutes in the warm oven. Remove the banana bread from the oven and allow it to cool at least 1 hour before tugging on the parchment paper to release it from the loaf pan. Transfer to a cutting board and cut into slices and serve. Sounds amazing. Can we sub arrowroot powder for the tapioca? Hi Leigh, You certainly can! I hope you enjoy! OMG this looks amazing, going to try and modify it to be egg free since I am allergic! Hi Stephanie! Thank you! Let me know how it turns out! I love how you seriously wouldn’t know this bread was paleo to look at it. Seems like it really would taste simply amazing. OMG the texture of this bread looks so moist and perfect! You are a paleo baking magician, my dear!! Raspberry and chocolate…..yummy! This looks so good. Oh I love you! Must make as soon as I get the raspberries! Any luck with different berries? I have a bunch of blueberries on hand. Amazing. 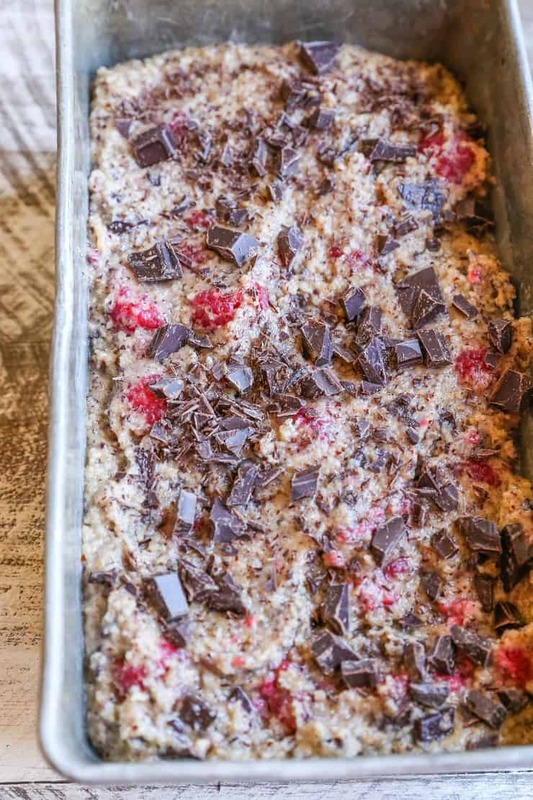 This paleo Raspberry Chocolate Chunk is mouth-watering. 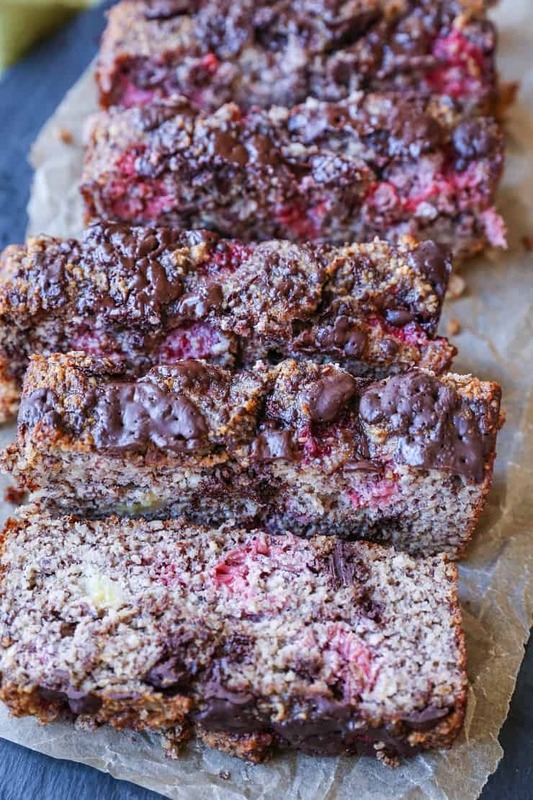 We can use the kale bread also with this paleo raspberry chocolate. Thanks for the step by step pics, I really enjoy….This makes me confident in what it should look like!